Gems of discovery come about in rather unique ways and for our members this gem came through an enquiry the day of the visit by the members of the Royal Australian Historical Society. Mrs. Dinah Harvey asked if I knew where Seven Oaks Farm had been or if the Historical Society had any information on it. 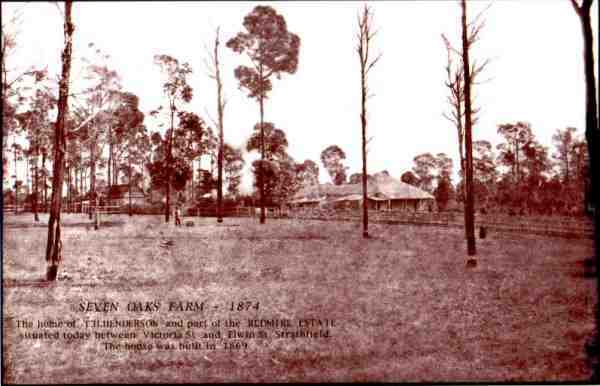 I had to plead ignorance at the time and since then have entered into telephone and written communication with the present result that Mrs. Harvey has sent me a full copy of all transcriptions collated by her on the property “Seven Oaks” Farm in Homebush Road which she is of the opinion was bounded Homebush Road, Albyn Road, Chalmers Road and midway between Victoria Street and Birnam Grove, owned by her great-great-grandfather,Thomas Albert Henderson. We record our sincere thanks to Mrs. Harvey for these valuable records and for the loan of three unique negatives from which I am having photographs printed. The first Memorandum of Transfer dated 4th November 1867 shows that William Billyard received twenty shillings from T. A. Henderson in consideration of nine acres one rood and 2.3 perches of land which was lot 3 of the subdivision of the Redmire Estate Wilshire’s Grant January 1810. A further transfer on the 25th August 1868 validates the purchase of 9 acres being Lot 4 for the sum of £91-17-6 from W. Billyard .A mortgage document dated 4th February 1868, Thomas Henderson to Stephen Biggs, records an amount of £150 but the mortgage was discharged on the 21st May of that same year . By May 1877 T. A. Henderson had transferred the Lots 3 and 4 properties to Charles A. Henderson (presumably his son) in consideration of £600 and in June 1881 Charles is shown as the proprietor of Lot 4. On January 1 1886 Charles A. Henderson transferred to John Booth Jones 8 acres plus for a sum of £4,500. It is assumed that the decrease in the size of the property came about by the declaration of the dedication to the public of Victoria Street. The present day Victoria Street is made up of a piece of Lot 3 and a piece of Lot 4, the Homebush Road frontage being reduced from 605 Links to 555 Links. It is also interesting that a mortgage was taken out by J. B. Jones with C. A. Henderson. Unhappily John Booth Jones was declared bankrupt and his property transferred to William Harrington Palmer in January 1910. Charles Henderson transferred the remaining portion of land to Thomas Riley of Strathfield in November 1912 for £2,600. Thomas Riley’s address is given as ‘Fairholme’ Fairholme Street Strathfield. Victoria Street was at some time called Agnes Street but not in existance at time of original subdivision by Billyard. Bushy Hill Street is now Albyn Road -section west of Homebush Road. A Water Board Map of the 1889 series but probably commenced in 1881 shows a house fairly close to Victoria Street (named Agnes Street on map) and Mrs. Harvey suggests this might be the original Henderson home. Other properties on this map are identified as ‘FRANKLIN’ cnr. Bushy Hill Street (Albyn Rd) and Homebush Road -‘ECCLESVILLE’ cnr. Florence St. and Bushy Hill Street -‘COOMERABONG’ west cnr. Florence Street and Albyn Road and ‘WENDOUREE’ cnr. Florence and Elwin Streets. This is not the first time that Mrs. Harvey has attempted to help our Society and we are most grateful for her patience and assure her that this information will be respected and duly acknowledged.